Description This Lookout Mountain, Georgia bed and breakfast has an outdoor pool, free internet access and non-smoking guest rooms. 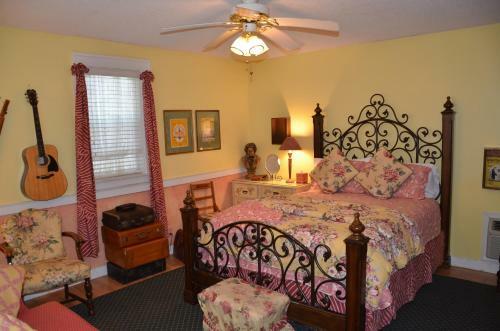 Located 3 minutes' drive from Rock City Gardens this bed and breakfast features a daily hot breakfast seasonal outdoor pool and hot tub. Ruby Falls is less than 6.4 km of the property.Free Wi-Fi a cable TV and coffee-making facilities are included in all individually decorated rooms. A small refrigerator can be provided upon request at this Lookout Mountain Garden Walk Inn.Guests at this pet-friendly inn can stroll through the on-site gardens or relax at neat near the fire pit. Garden Walk Inn offers free parking as well.Chattanooga city centre is 11.2 km away. Guests can explore Lookout Mountain from the Incline Railway a 19th century passenger tram 9 minutes' drive from the property. Add Garden Walk Inn to your free online travel itinerary.